This was an easy play activity to set up one morning. A few spoons, a bowl of ice, and a mini muffin tin made for an extra cup of coffee for momma! I pulled this tray-of-fun out on a morning that my nephew (18 months) was here with us and Baby Girl went to work scooping and grabbing at the ice. This is a great activity for toddlers. At this age, they are getting the hang of the spoon and the slick ice cube is wobbly enough for great practice. They scooped the ice up from the bowl and slid it into the mini muffin tin cups. 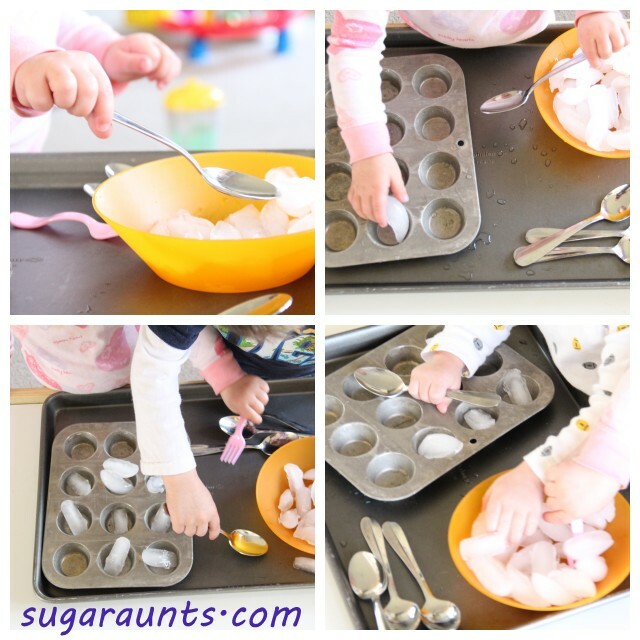 Scooping and moving the ice into the muffin tin is great visual-motor work. Visual Motor Integration is the ability to control the movements of the hands in an activity as they are guided by vision. Another term for this is eye-hand coordination. It is the ability to plan, execute, and monitor a motor task given visual input. What are we working on with this PLAY activity?